A fountain adds beautiful movement and the sound of flowing water to your home’s outdoor environment while providing the landscape with a unique visual focal point. 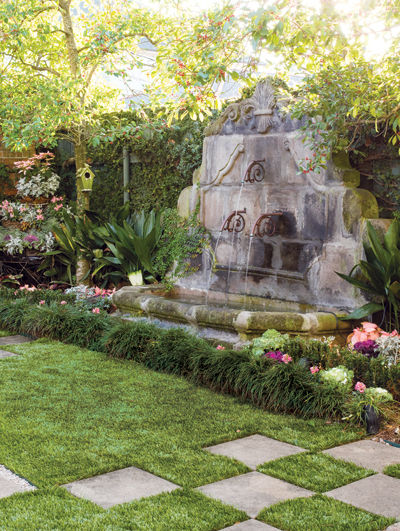 Canine playtime in the back garden of Elaine Bergeron’s Old Metairie home forced Jesse Edmundson, lead landscape architect at The Garden Gates, to rethink the use of genuine grass turf surrounding the newly-installed pavers and refurbished three-tier fountain. The installation of anti-microbial synthetic turf, or “Pet Grass” was the ideal design solution, providing excellent drainage and minimal maintenance. The 19th century Greek key fountain with shell bowl was acquired in France and installed following the renovation of Dr. Richard Sherman’s Bywater home. Placement of the water feature is on axis to the brick courtyard providing an additional garden vignette. Landscape architect Marianne Mumford of Landscape Images Ltd. created an intimate terrace suitable for drinks or dining al fresco at the Garden District home of Dr. and Mrs. Rand Voorhees by scoring and staining the existing backyard basketball court. Following through on the designer’s suggestion that a fountain would create the perfect focal point, homeowner Terry Voorhees acquired this early 20th century English fountain at New Orleans Auction. The 19th century French trumeau-style stone fountain with Bacchus water feature was centered on the long axis of the center hall of Dr. Richard Sherman’s 1836 Creole cottage. Installed after the home’s renovation, in conjunction with the parterre garden, its placement is visible from the main entrance of the straight through the entire house. Kenneth Rabalais, Jr., founder of The Plant Gallery, suggests that a successful installation protocol includes avoiding shifting soil by using a layer of crushed limestone to create a sturdy ground base if the fountain will not be placed on concrete or tile. Tying into an existing irrigation system allows automatic refill to protect the pump from evaporation and adding underwater lights keeps the fountain from disappearing after dark. The Plant Gallery installed the three-tier Fonthill Fountain that serves as the landscape design cornerstone of Chip Forstall’s newly completed home at the top of Lake Vista.